Driving home earlier this week I was delighted to see a cloud of snowdrops underneath the oak trees. They always bring me joy. Maybe it’s because they are one of the few plants to flower in the middle of winter? Of course, there are many more. Click here for a list of snowdrop-packed gardens to discover around Britain. I planted snowdrops in my hanging baskets, they should would appear after the pansies… but no such luck yet. Perhaps mine are late bloomers! I should have consulted our book, Seasonal Garden Ideas. It has lots and lots of easy projects, some of which can be undertaken in a matter of minutes. 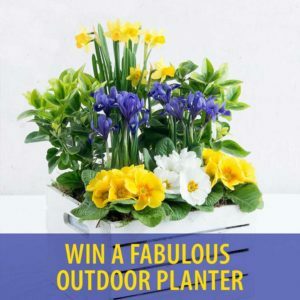 Or for a spring colour – no effort guaranteed – enter our competition to win a beautiful spring planter.